Twitter is beefing up its search function - and in doing so the micro-blogging site is positioning itself as an alternative to Google. The newest update soon will allow Twitter Search to troll into the links people post and make that material searchable. This should mean better search results, which means Twitter becomes a more useful search alternative: you can see, in real time, what people are talking about, and which articles they're reading. Currently the search only looks at word in the 140-character micro-blog, which somewhat limits the content it can pull up. A message that says "Cool article: LINK" wouldn't be very useful in the current search, for example. Of course there is no way Twitter Search will index as many pages as Google, but that's not the point. Twitter Search isn't meant to replace Google, that'd be dumb. At this point, no one is going to beat Google at its own game (you hear that Microsoft?). Twitter Search is meant to be a different kind of powerful search engine in its own right. A smaller, potentially curated, real-time search engine. This is expected to make it faster than Google, mainly thanks to the nature of tweets being speedy to send, as opposed to web pages, which are slow to build. If you're a big Twitter user you likely have noticed some changes to the interface. "Trending topics," the discussions that are getting the most buzz on Twitter, now appear on the site's right-hand rail, instead of only on the separate Search Page. You can click through the trending links to get a feel for what people are chatting about online. Twitter says these links "are a compelling if rudimentary way to explore a collective global consciousness." Twitter now allows users to save searches, which can be useful for people who are interested in particular subject: coffee, environment, Atlanta, swine flu, free chicken - just for a few examples. To save a search: first search the term you're interested in, then click the "Save This Search" button just above the results, on the right. What do you think of the Twitter Search? Is this big, or is it hype? It seems like the developments indicate another shift in the site, which, as TechCrunch says, may become more useful as an information aggregator than as way to connect to celebrities, etc. [Also worth noting, Twitter says it's not for sale - at least not right now. Scott Rosenberg makes an interesting point on his blog, Wordyard: he says innovation ends when cool tech companies go completely corporate]. 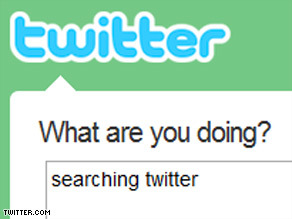 Find more about the search directly from Twitter's blog. Twitter and "texting" is for idiots! What about combining the power of Google and Twitter and having an engine do both at the same time? I've seen a few that are integrating search functionality so you don't have to go to multiple sites to find what you want. One is leapfish.com + a few others. I think it's great but why do you have to keep going from site to site to find what you want. Hopefully some of these search guys are listening. There have been rumors floating around the blogosphere that Google is interested in buying Twitter, and the more popular Twitter becomes the more valuable it becomes. Frankly, I hope Google does NOT buy Twitter; I hate to see all the entrepreneurs with great ideas get taken over by the big guys. But this is the way that these big guys got big: by buying latest technology where they didn't have the resources nor time to do it themselves. Good examples are the Google Maps, Google Earth, etc. Yahoo's Flickr, etc. But having more independent companies like Facebook and Twitter adds more variety to the landscape of technology; I would find it boring if all the tech companies were simply subsidiaries of Microsoft, Google, HP, Dell, etc. Right now, it is already boring . . . While this sounds innovative at first, it will actually serve to decrease innovation. If the results you get to your search are the things the most people are "tweeting," you'll never see anything original. You'll only see the same poorly-reported, urban-legend type information. To "Mike" the privious poster: Leapfish DOES NOT combine Twitter with other search engines like Google. It does, however, combine videos, news, and images so it is just another metasearch engine in my book. No bells and whistles there. Just what I need - the ability to search banal web-mumbling. Do you ever feel like you need to get in touch with the universe/nature and if yes, how do you go about doing so?